The above copper farthing token measures 15.9 mm and weighs 0.92 grams. It was issued in the name of Abraham le Keux of Norton Folgate, London. Obverse: (mullet) ABRAHAM . LE . KEVX , around cable inner circle, depiction of three barrels (or tuns) lying on their sides in a triangular formation within. Reverse: Legend within in three lines reads; . IN . / NORTON / FALGATE (rosette) below. 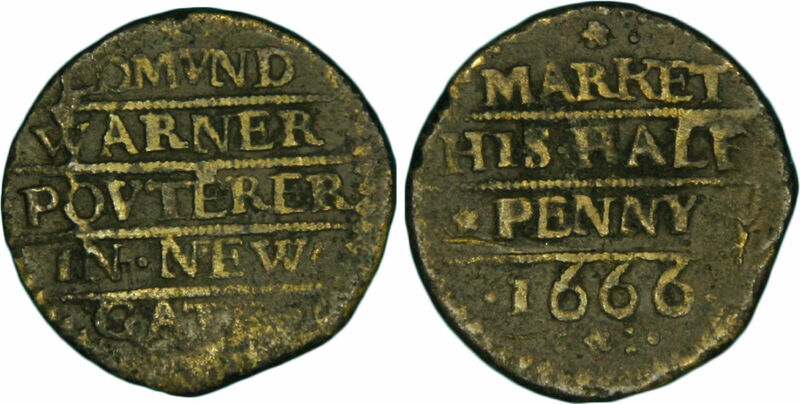 There is no date on the token to indicate when it was issued, however, on stylistic grounds it seems to date from the mid-1650s to early 1660s. 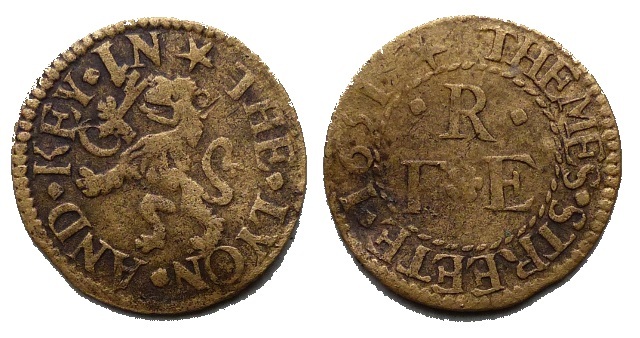 The token is one of 12 different designs of farthing and half penny tradesmen’s tokens know to have been issued in the Liberty of Norton Folgate between 1648/9 and 1672 (1). 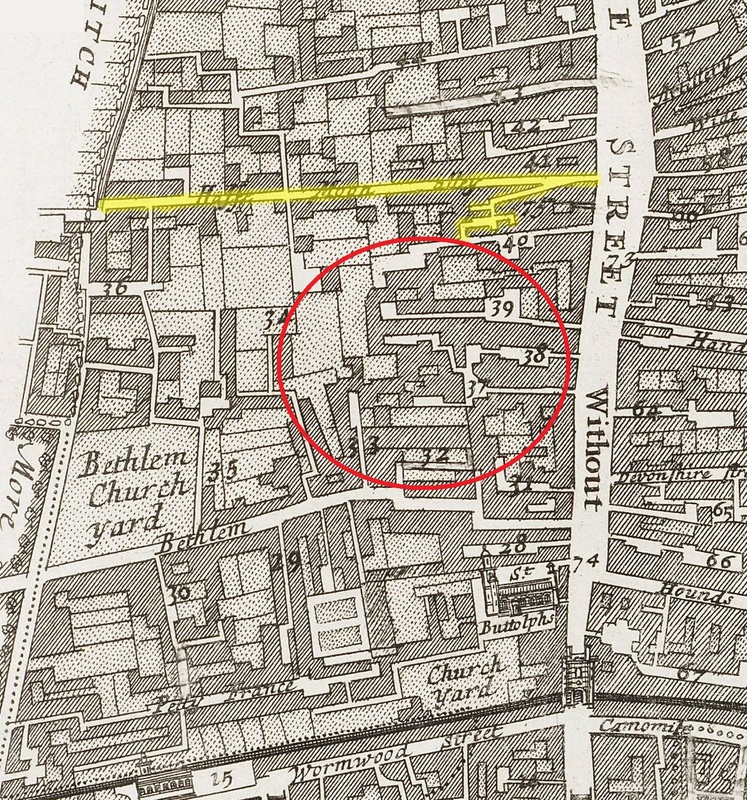 In the 17th century Norton Folgate was an independent Liberty located between the Bishopsgate Ward of the City of London to the south, the parish of St. Leonard, Shoreditch to the north and the parish of Spitalfields to the east. 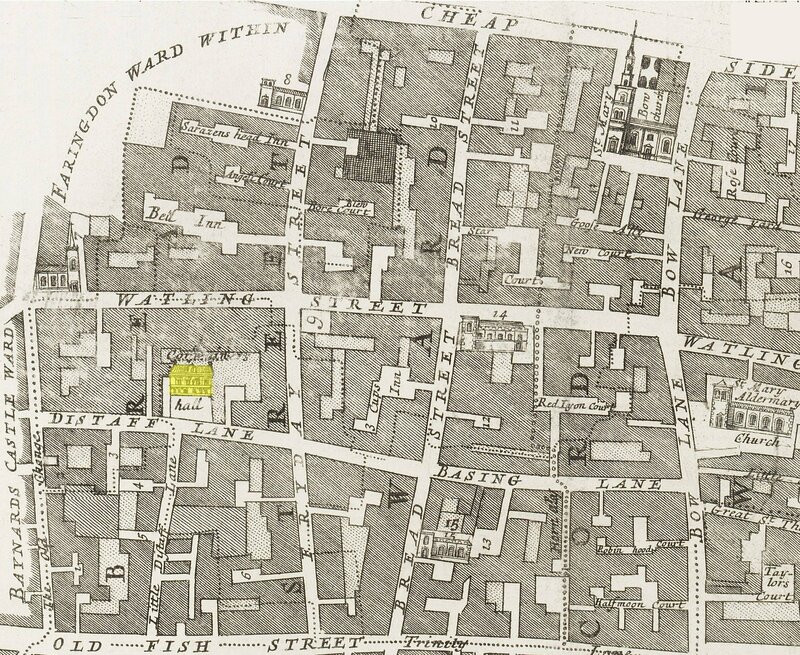 The Liberty originally comprised monastic land outside the city gates and by the mid-17th century comprised Folgate Street (formerly White Lyon Yard or White Lion Street), Spital Square, Elder Street, Fleur de Lis Street and Blossom Street. 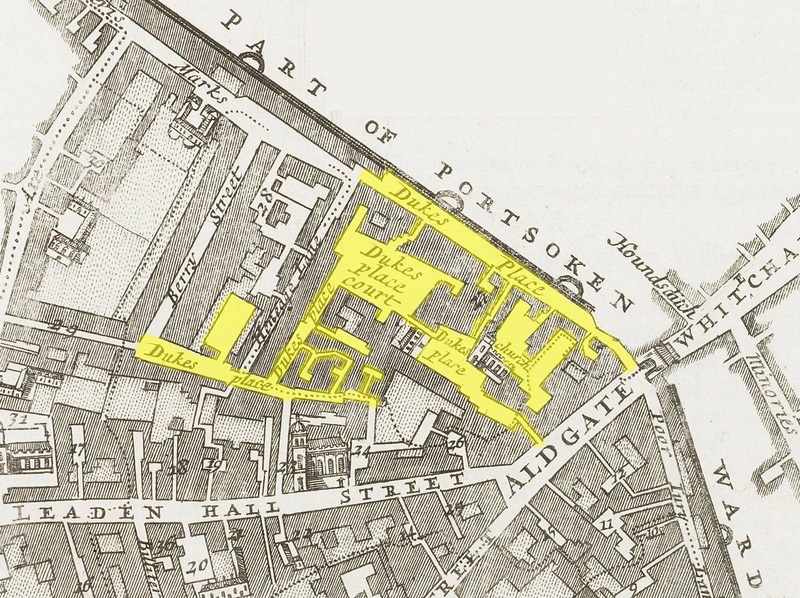 After the Reformation in the 1530s Norton Folgate became a self-governing area of approximately 9 acres. 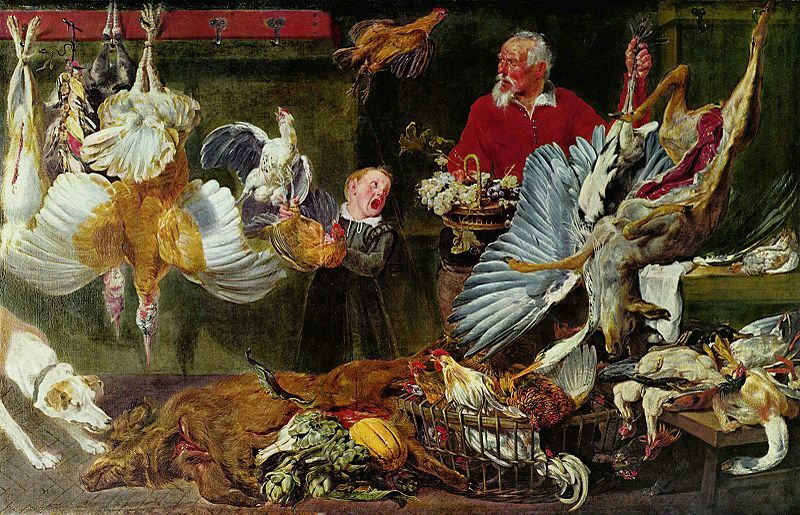 Like East Smithfield it was a part of London where “outsiders” were allowed to live and practice their respective trades free from the control of the city’s Guilds and Livery companies. 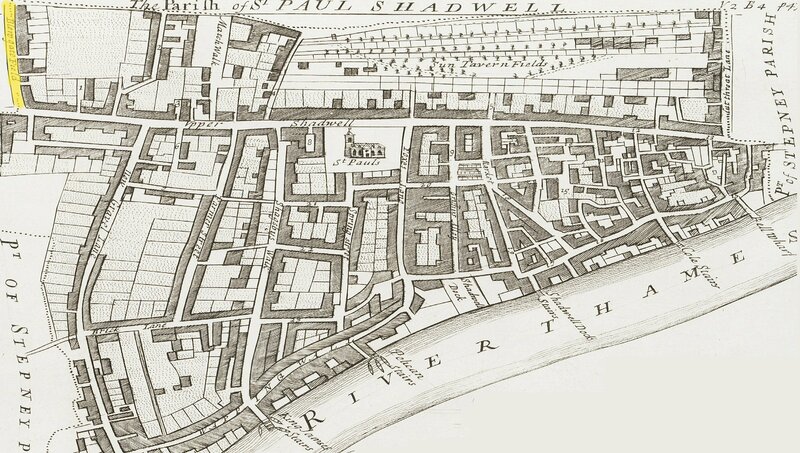 In the early 18th century the area (including Spitalfields) became particularly popular with immigrant Huguenot weavers from France – some of whose houses and business premises survive in the area to this day. This concentration of French speaking immigrants in the Spitalfields area ensured the survival of a distinctive culture and identity for several generations. Both their language, diet and fashions set them apart from the native Londoners and they soon acquired a certain respectability. Even in 1738, William Hogarth could contrast the clothing and behaviour of a French Protestant congregation leaving church with the poverty, squalor and sexual immorality of other Londoners. Many prospective English gentlemen about to set off on the Grand Tour made an initial visit to the Spitalfields area to polish their language skills. 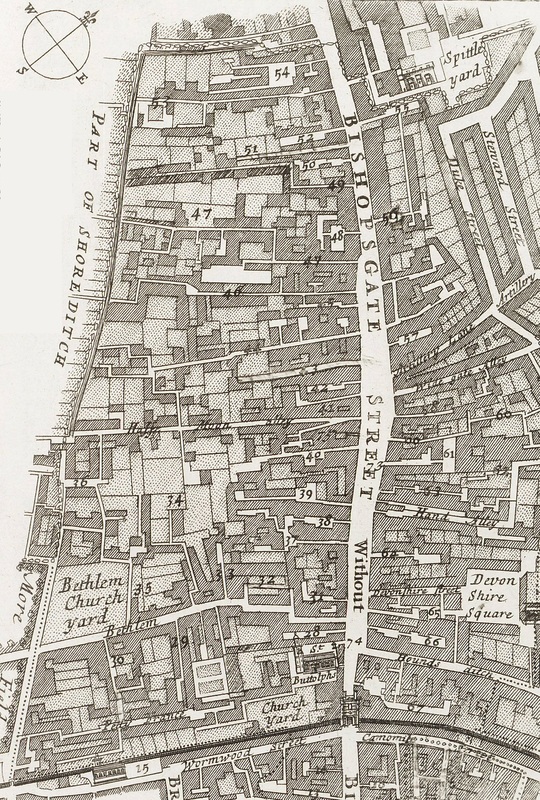 Based on the information given on the above token the premises of its issuer, Abraham le Keux, was at or by the sign of the three tuns in Norton Folgate. 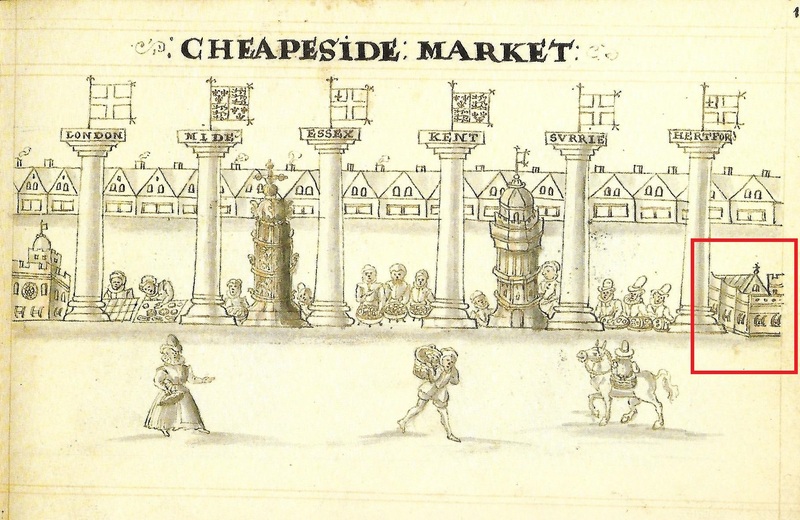 In mid-17th century London this trade sign was traditionally used to mark the location of brew houses and taverns. It also formed the central device of the arms of the Worshipful Company of Vintners (2). However, for reasons to become obvious later it is unlikely that our token issuer was engaged in any one of the above or similar trades (Note 1). 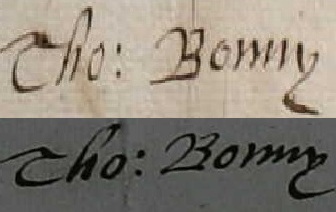 A review of Hearth Tax returns for London and Middlesex for 1666 has failed to identify anyone in the area of Norton Holgate (and the immediate environs) with the surname “Le Keux”(3). 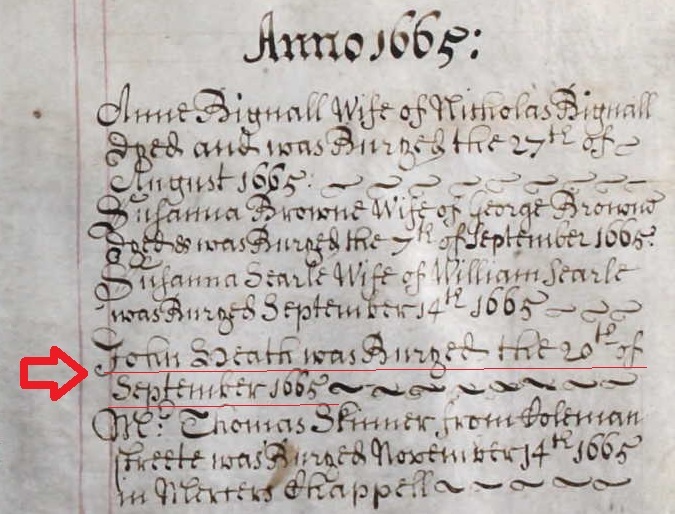 This implies that by that time the issuer and his family had either moved out of the area or had possibly perished during the Great Plague of 1665. 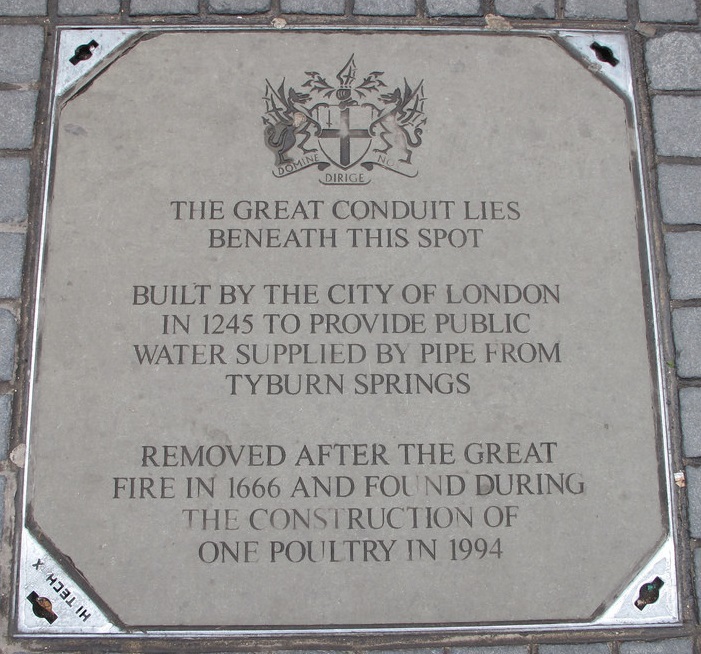 Being outside that area of the city that was directly affected by the devastation of the Great Fire of September 1666 we can discount this as a possible reason for them leaving the area. The token issuer’s surname offers a significant clue as to his ancestry as “Le Keux” is derived from Old French (i.e. queu, keu, kieu or cu) denoting a cook or someone who operated an eating house (4). A search of mid-17th century parish registers from this particular area of London has failed to identify an Abraham le Keux. However, a similar review of non-conformist church registers revealed the following marriage entry (the original written in French) from the registers of the Walloon and French Protestant Chapel of the Hospital, Spitalfields (Note 2). 23rd November 1642 – Abraham son of Pierre le Keux native of Canterbury & Barbe daughter of Sebastian Brigode. Further genealogical research has identified Abraham le Keux as a third generation Huguenot immigrant. The name of his wife and father-in-law indicate that they were almost certainly of similar Calvinist descent. Born in Canterbury on 3rd November 1617, Abraham was one the oldest of 10 children born to Pierre le Keux and his wife Anne Du Chasteau between 1617 and 1636. Abraham’s father, Pierre, was one the oldest of 4 children born between 1580 and 1590 in Canterbury to Anthoine le Keux and Jaquemyne de le Haie. It has not been possible to trace the family’s history in England any earlier than 1580 which suggests that it was only shortly before that date that they fled from persecution in France. Huguenots were French Protestants inspired by the writings of the reformation theologian John Calvin (1509 to 1564). Their numbers peaked near to an estimated two million by 1562 and were mainly concentrated in the southern and central parts of France. While their numbers were drawn from across French society the new religion had a particular following amongst many of the educated tradesmen. At this time the Huguenots represented approximately an eighth of the number of French Christians. As the Huguenots gained influence and more openly displayed their faith, Catholic hostility grew, in spite of increasingly liberal political concessions and edicts of toleration from the French crown. A series of religious conflicts followed, known as the Wars of Religion, that were fought intermittently between 1562 and 1598. The wars began with the Massacre of Vassy on 1st March 1562, when dozens (some sources say hundreds) of Huguenots were killed, and approximately 200 were wounded. It was in this year that some Huguenots destroyed the tomb and remains of Saint Irenaeus, an early Church father and bishop. Thereafter the Huguenots became organized as a definitive political movement. Protestant preachers rallied a considerable army and a formidable cavalry, which came under the leadership of Admiral Gaspard de Coligny. Henry of Navarre and the House of Bourbon allied with the Huguenots, adding wealth and holdings to the Protestant strength. At the height of their power the Protestants controlled sixty fortified cities and posed a serious threat to the Catholic crown and Paris. In what became known as the St. Bartholomew’s Day Massacre of 24th August 1572, Catholics killed thousands of Huguenots in Paris. In the weeks that followed similar massacres took place in other French towns including Aix, Bordeaux, Bourges, Lyons, Meaux, Orleans, Rouen, Toulouse, and Troyes. Nearly 3,000 Protestants were slaughtered in Toulouse alone. By mid-September almost 25,000 Parisian protestants had been killed while in the provinces a further 3,000 to 7,000 perished. Beyond Paris, the killings continued until 3rd October. An amnesty granted in 1573 pardoned the Catholic perpetrators. The persecution of the Huguenots in France finally ended with the granting of the Edict of Nantes (1598) which allowed the Huguenots substantial religious, political and military autonomy (Note 3). Not surprisingly from the 1560s onwards increasing numbers of Huguenots started to flee France for the safety of adjacent Protestant countries who would offer them refuge. As part of this exodus many Huguenots crossed the English Channel to start new lives in south-east England. They settled initially in the coastal towns at which they landed. These included Dover, Rye, Folkestone and Sandwich. In 1575 the town authorities in Sandwich, Kent, decided that they were reaching the limit in terms of the number of Huguenot refugees they could accommodate. It was at this point that the nearby city of Canterbury decided to accepted 100 refugee families to eleviate the situation. 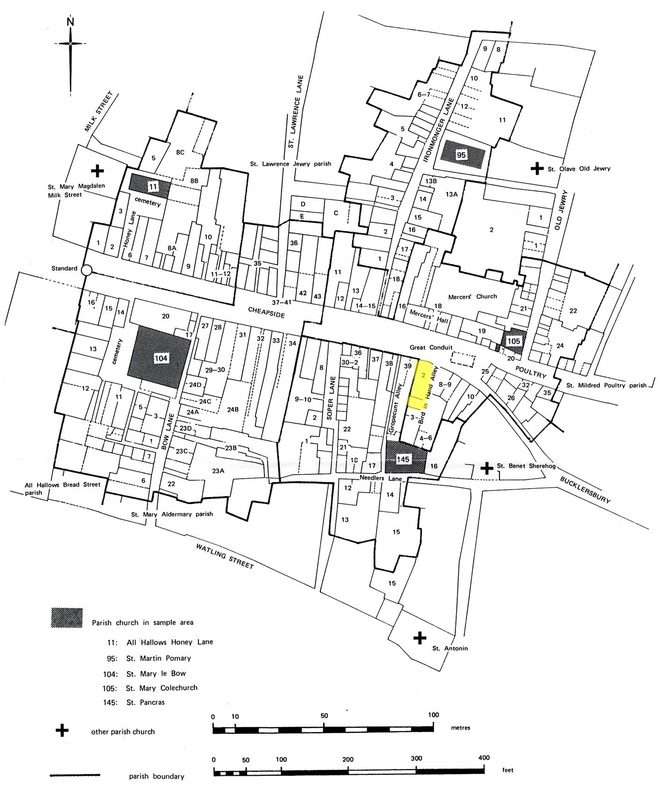 It is very possible that Abraham le Keux grandparents were amongst this initial influx of Huguenots into the city. In the years that followed Canterbury became a favourite destination for those Huguenots who reached the safety of south-east England to the extent that their community came to represent the largest foreign population outside London. These early Huguenot refugees, most of whom were known by the native English as “Walloons” or simply “strangers”, were silk weavers and wool dyers. Their textile production techniques were superior to those of the English at that time and their cloths were generally of a far superior quality. The welcome extended to the Huguenot refugees from their adoptive English communities partly reflected the perceived economic benefits they could offer, particularly with regards to developing the local textile industry. On the back of the new textile processing and weaving techniques introduced from the continent, new weaving and draperies were established in textile towns such as Canterbury. The Huguenot’s skills allowed the production of lighter fabrics, made from a mix of fibres, suitable for export to Europe, rather than the traditional heavier local woollen fabrics. Such were the economic benefits to Canterbury from the Huguenots that laws were introduced by the Privy Council to protected them when they became threatened from attack from established local textile workers and prejudicial locals. 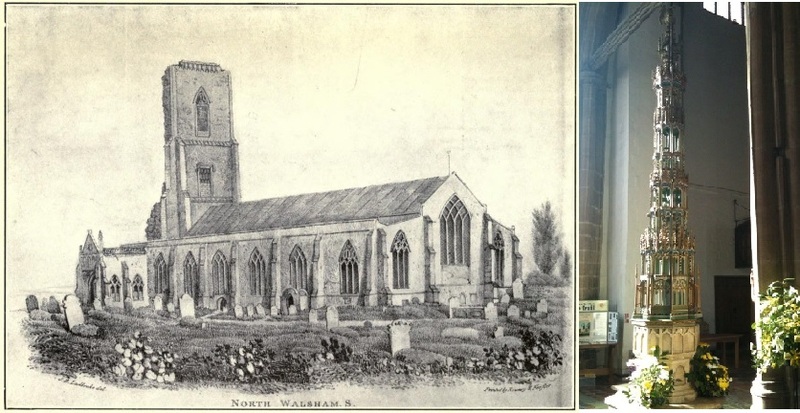 Canterbury’s city authorities allowed the French refugees to conduct their own services of Christian worship (in French) in the church of St. Alphege which was made available for their use. Later, when their numbers became too great for one church, the western end of Canterbury Cathedral crypt was also made available for their worship. It is extremely likely that Anthoine le Keux, the grandfather of our token issuer, was a silk weaver and that both his son Pierre and grandson Abraham were brought up and possibly locally apprenticed in Canterbury to learn the silk and/or cloth trades. 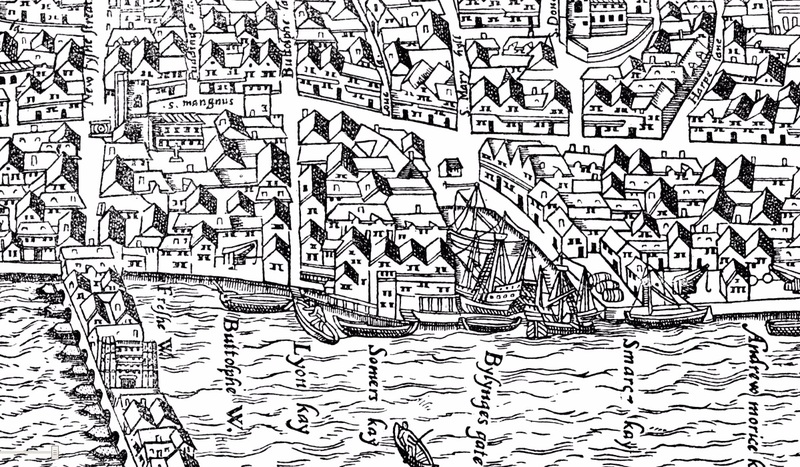 It is not known when Abraham le Keux left Canterbury to set up home and a new place of work in London but it must have been prior to his marriage to Barbe Brigode on 23rd November 1642. In 1642 he will have been 25 years of age. We can assume that he was apprenticed in Canterbury to a master weaver within his own community at the age of around 12. Thereafter he would have spent 7 years serving his new master and learning his trade before being finally freed to practice his trade and become a master weaver in his own right. It is interesting to note that despite having been in England for three generations members of the le Keux family were still looking to within their own community for marriage partners. This, coupled with the fact that French was still the language of their worship and community records suggests a relatively low level of integration with the native English communities amongst whom they lived. For those Huguenot families that were privy to certain silk weaving secrets this insularism no-doubt helped protect their family’s commercial interests. 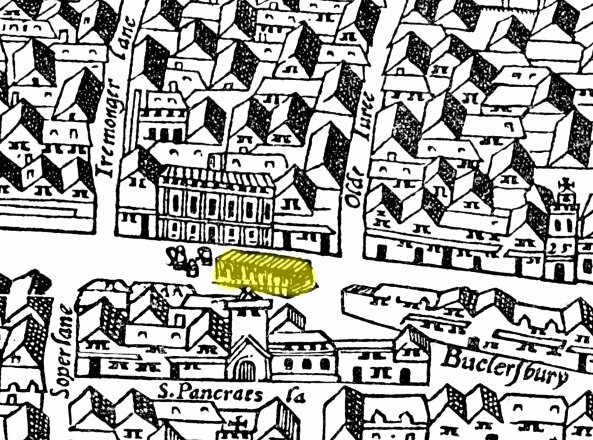 Abraham likely chose the Spitalfields area to live in as it already played host to a small Huguenot community and church (Note 4). 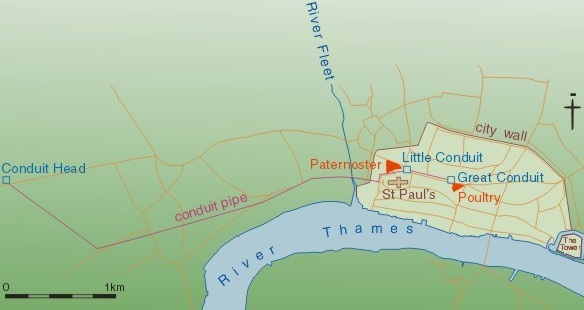 It’s Liberty status also meant that tradesmen who settled there were free from the trading restrictions applied in most other parts of the city by the various London livery companies. 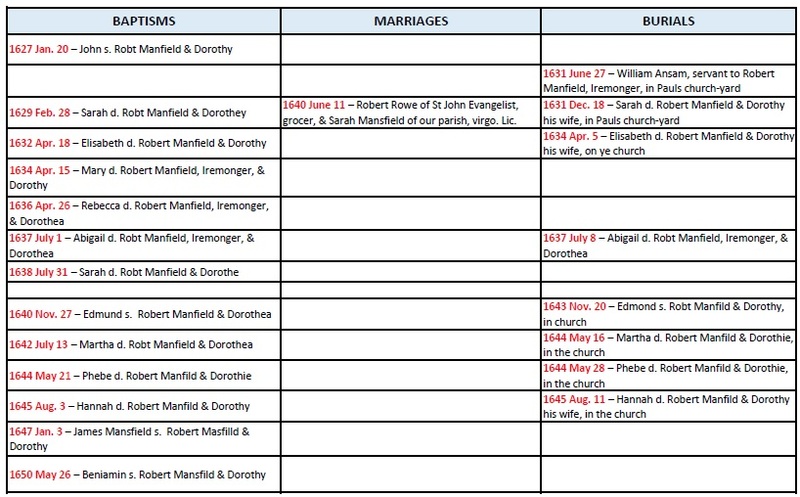 Within a year of being married Abraham and Barbe had the first of six children (listed below) all but one of whom are recorded in the baptism records of the Walloon and French Protestant Chapel of the Hospital, Spitalfields. It is not known how many of the above children survived into adulthood or if any of them went on to join the family business. Unfortunately, no further record of Abraham le Keux’s business or life history are known. However, the 1662 marriage entry for Marie le Kuex (to Samuel de Lespau of Canterbury) suggests that both Abraham and Barbe were still alive and living in London at that time. 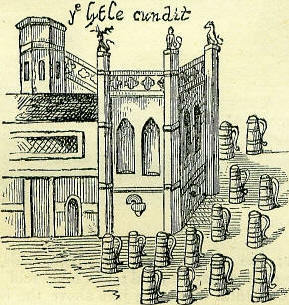 A review of Huguenot tradesmen operating in the Spitalfields area during the later 17th and 18th centuries indicates several individuals bearing the surname “le Keux”. These include the engravers Peter and Henry le Keux plus the master silk weaver Peter le Keux, a wealthy silk weaver who supervised two hundred and fifty looms in the Spitalfields area. 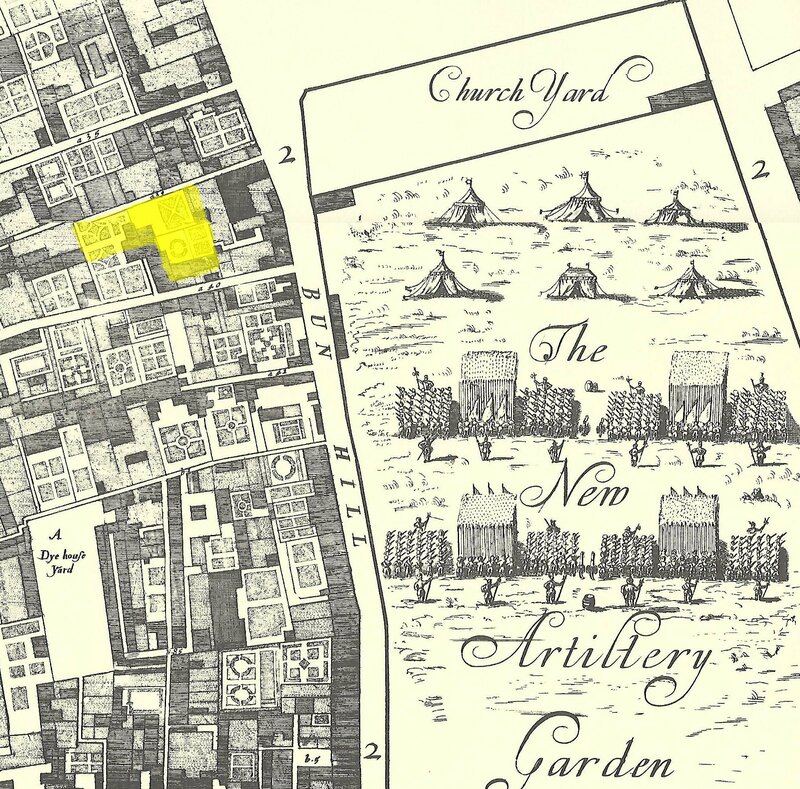 Tracing back through the ancestry of the above “le Keux” families none of them appear to be directly related to Abraham le Keux the token issuer of Norton Folgate, despite several of their families having pre-Spitalfield origins in the Huguenot community in Canterbury (5). 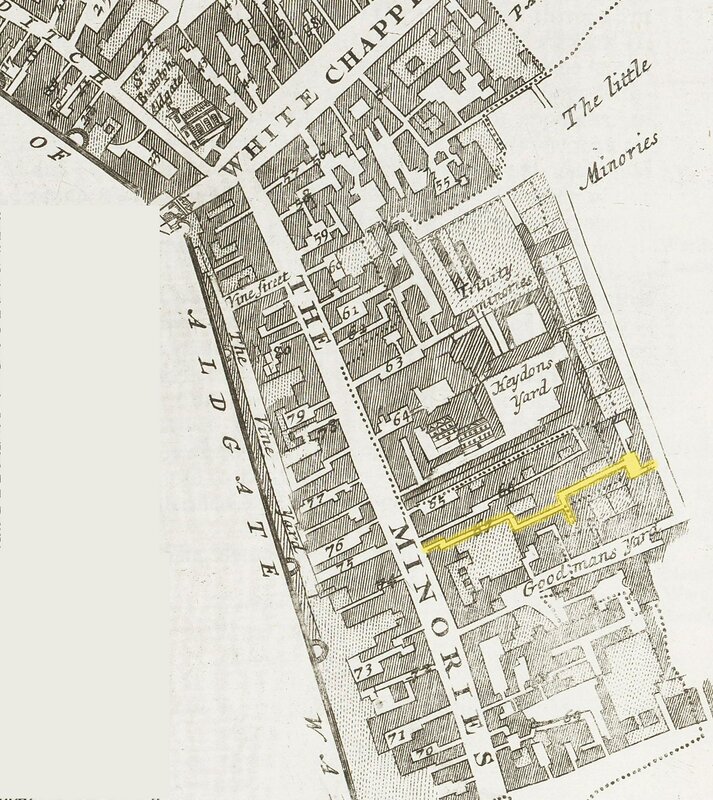 Angel Alley (Dowgate Ward) – Obadiah Surridge at the sign of the Angel in Angel Alley. Half Penny. 1668. Barbican – William Shatchwell at the sign of the Weavers’ Arms. Undated Farthing. Green’s Rents (Fleet Bridge) – William Warde at the sign of the Weavers’ Arms, Fleet Bridge. Half Penny. 1666. As well as being recorded as a Weaver William Ward also traded as a sea coal seller from the same address. 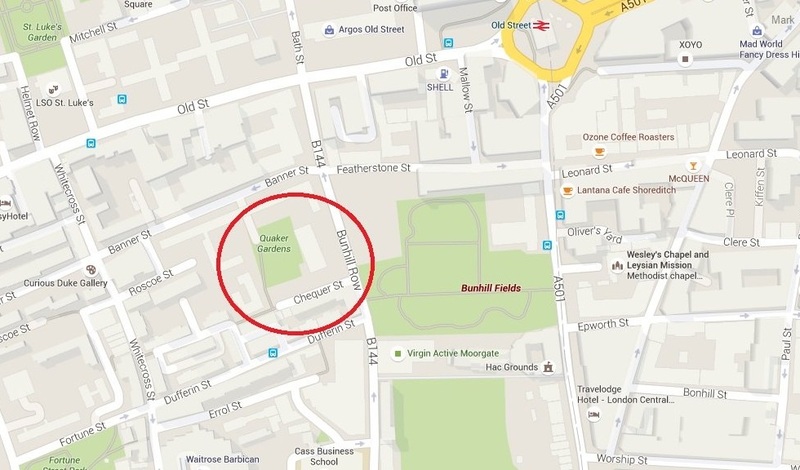 Snow Hill (Farringdon Ward Without) – Gabriel Bonner at the sign of the Grocers’ Arms. Undated Farthing. 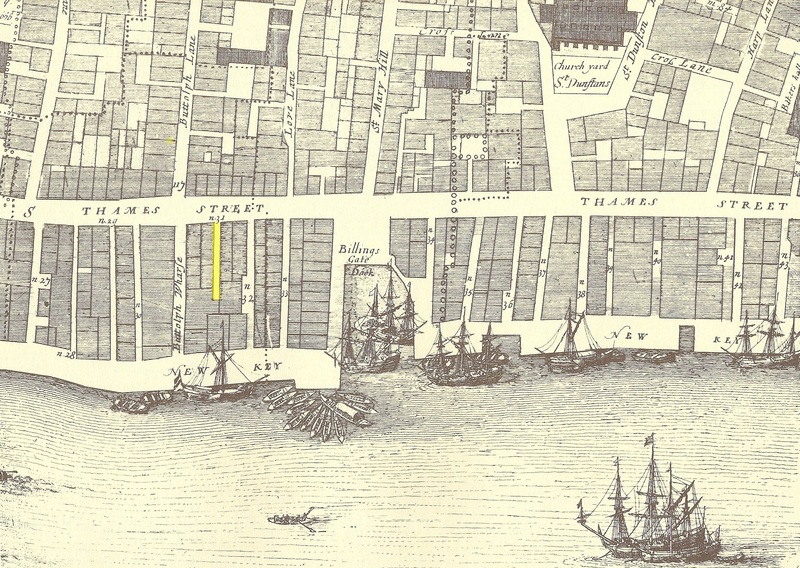 Finch Lane (Cornhill & Broad Street Wards) – Thomas Stubs at the sign of the Bull and Horseshoe. Half Penny. 1669. Ratcliff Highway – Robert Davers at the sign of the Weavers’ Arms. Undated Farthing. Hackney – John Davis in Hackney. 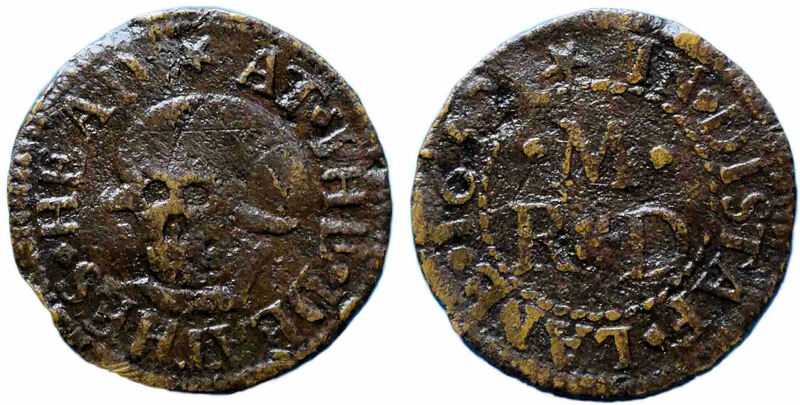 Farthing 1667. Hog Lane (Shoreditch) – John Bavet at the sign of the Horse & Dog. Undated Farthing. Mile End – George Smith (at the Weavers’ Arms) in Mile End, Weaver. 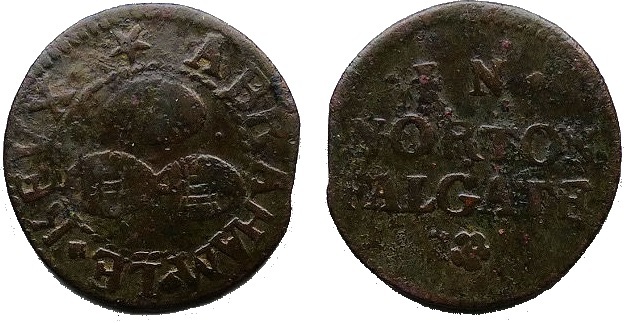 Farthing 1658. 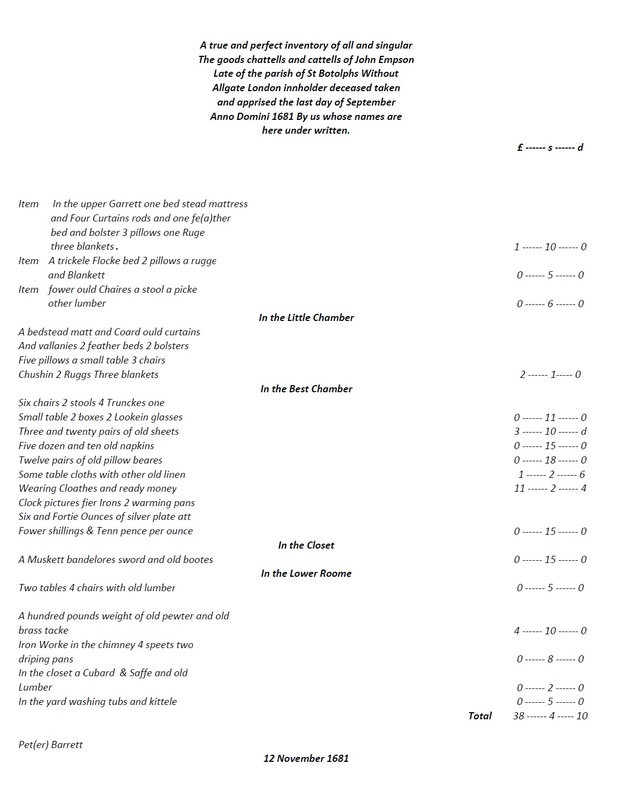 Wapping – Thomas Pierce at the sign of the Shears. Undated Farthing. Spitalfields – John Ormes at the sign of the Red Lion in Spitalfield. Undated Farthing. On first appearances, and without the benefit of further historical research results, only one of the above tokens can be conclusively identified as being issued by a weaver (i.e. that of George Smith of Mile End whose trade is included within the token’s legend). Approximately half of the tokens listed infer their issuers’ trade as being a weaver due to the selection of their respective trade sign, i.e. the coat of arms of the Worshipful Company of Weavers or a pair of cloth shears/scissors. A review of the above token issuers’ surnames suggests none of them had their origins in the Huguenot community. A review of similar tradesmen’s tokens issued in locations in Kent that are known to have had established mid-17th century Huguenot communities has similarly failed to identify any weaver’s tokens with Huguenot surnames (10). This observation potentially makes the Abraham Le Keux tokens from Norton Folgate a significant and important discovery. 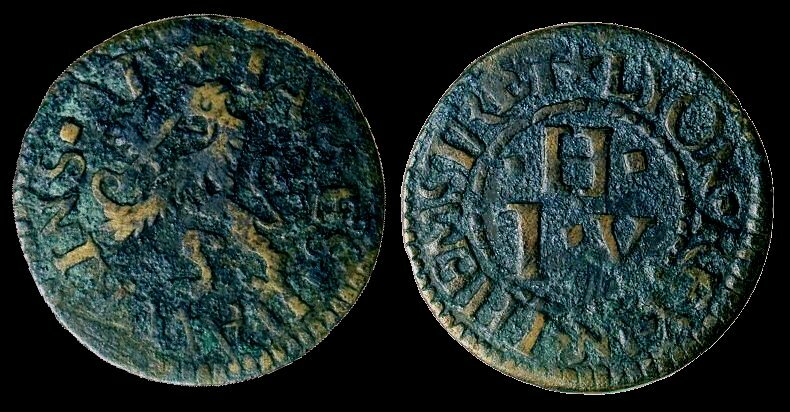 Like their English puritan cousins, the Huguenots did not drink alcohol and thus despite the appearance of the three tuns trade sign on Abraham le Keux trade token. And the derivation of his surname’s meaning, he is considered extremely unlikely to have found his way into the mid-17th century hospitality or vintners’ trades. 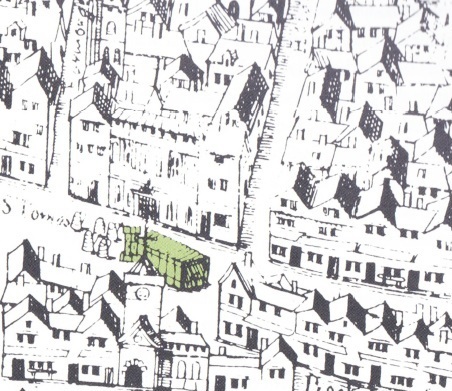 The Chapel of the Hospital was located in Spitalfields and looked after the initial needs of the emerging Huguenot community in this area of London. It was effectively established as a daughter church to London’s central French and Flemish Protestant church in Threadneedle Street. This mother church was founded in 1550 by King Edward VI who granted Protestant refugees freedom of worship by royal charter. This central church had previously been St. Anthony’s Hospital Chapel and thereafter simply became known as “the French Church”. 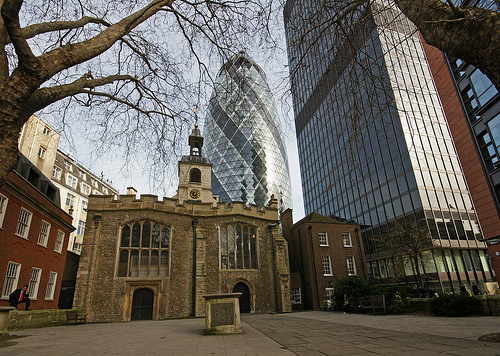 The medieval building, which dated back to the thirteenth century, was destroyed in the Great Fire of London, but by 1669 the hardworking Huguenots had erected a new church, one of the first to be rebuilt after the fire. It was demolished in 1841 to make way for the Royal Exchange. After the revocation of the Edict of Nantes by Louis XIV in 1685 there was a large second wave of immigration by French Protestants to England and by 1700 in the region of 5 per cent of London’s population were Huguenots. The majority of this second wave of immigrants were attracted to the earlier established Huguenots communities such as those in Canterbury and Spitalfelds. With them they brought a further wealth of trade secrets and in some cases financial capital also. The Huguenots contributed overwhelmingly to the development of London’s textile, gun-making, silver, watch and clock-making industries, to the creation of the banking and insurance business as well as to the sciences and the arts. By the 18th century, the Huguenot families had begun to integrate with the local English population. The girls married local men and their names changed. Many of the others anglicised their names and most became English citizens. Many successful Spitalfields weavers established the viability of their businesses in Canterbury before making the move to London. As the Spitalfields weaving business flourished in the 18th century, the Canterbury industry went into decline, ceasing entirely in 1837 as a result of the introduction of mechanisation to the industry. Hanks, P. & Hodges, F. – A Dictionary of Surnames. (Oxford, 1988). Agnew, D.C.A. Rev. – Protestant Exiles from France in the Reign of Louis XIV – The Huguenot Refugees in Great Britain and Ireland. Index Volume. (London, 1874).